What is a central line associated blood stream infection? Bloodstream infection in a patient having a central line (CL) anytime after day 2 of CL insertion and until a day after CL removal is considered to be a central line-associated bloodstream infection (CLABSI) if there is no other obvious focus of infection. The patient may become ill with fever and chills; the skin around the catheter may become sore and red. How will I know if there is a bloodstream infection or not? Blood samples (ideally 2) will be sent for all patients having CL if they develop features suggestive of CLABSI (as mentioned above). If blood grows organism on culture (report will take at least 48 hours from the time of culture), a bloodstream infection is diagnosed. CL is a foreign body that causes a break in the skin; bacteria or other germs may travel down CL and enter the blood and cause bloodstream infection. It can happen despite adequate precautions and care (hand hygiene before and after patient care and early removal of CL when not needed) taken by doctors and nurses handling CL. CLABSI can often be successfully treated with antibiotics. CL may have to be removed in certain patients especially if they are very sick or the symptoms are persisting antibiotic therapy. Be aware that CLABSI can be a serious health problem and may result in drop in blood pressure and oxygen saturation and multiple organ failure; management of such patients may require admission in intensive care unit. What can I do to help prevent a CLABSI? If the bandage comes off or becomes wet or dirty, tell your nurse or doctor immediately. 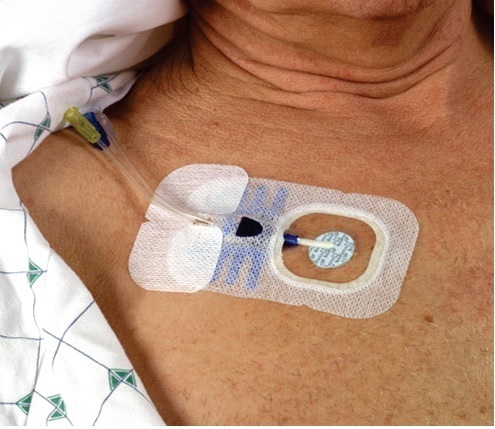 Inform your nurse or doctor if the area around your catheter is sore or red. Do not let family and friends who visit touch the catheter or the tubing. Make sure family and friends clean their hands with an alcohol-based hand rub before and after visiting you. How do I take care of my CL if I am sent home with CL? If you go home with a CL, your doctors and nurses will explain everything you need to know about taking care of your CL. While taking bath, use a clean plastic paper to cover the area of CL and make sure that it does not get wet. Adult males are requested to inform the dialysis staff in advance in case they are planning to shave their facial hairs. Always use an alcohol-based hand rub before touching the CL in case there is a need to handle it at home. Make sure you understand how to care for the CL before leaving the hospital and who to contact if you have questions or problems after you get home.